Search for all "Interleukin-12 beta / IL12B"
Mouse anti Human Interleukin-12 beta / IL12B OTI1A3. 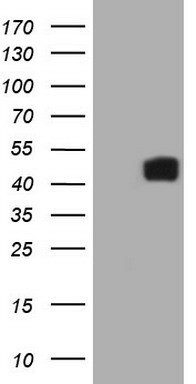 Full length human recombinant protein of human IL12B (NP_002178) produced in SF9 cell. This gene encodes a subunit of interleukin 12, a cytokine that acts on T and tural killer cells, and has a broad array of biological activities. Interleukin 12 is a disulfide-linked heterodimer composed of the 40 kD cytokine receptor like subunit encoded by this gene, and a 35 kD subunit encoded by IL12A. 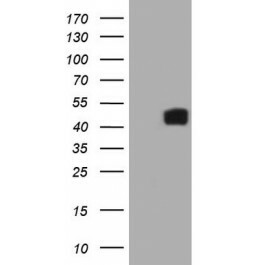 This cytokine is expressed by activated macrophages that serve as an essential inducer of Th1 cells development. This cytokine has been found to be important for sustaining a sufficient number of memory/effector Th1 cells to mediate long-term protection to an intracellular pathogen. Overexpression of this gene was observed in the central nervous system of patients with multiple sclerosis (MS), suggesting a role of this cytokine in the pathogenesis of the disease. The promoter polymorphism of this gene has been reported to be associated with the severity of atopic and non-atopic asthma in children. [provided by RefSeq, Jul 2008].